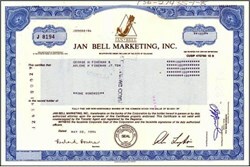 Beautifully engraved certificate from the Jan Bell Marketing, Inc. issued in 1994. This historic document was printed by the American Banknote Company and has an ornate border around it with a vignette of the company logo. This item has the printed signatures of the Company’s President and Secretary and is over 8 years old. This is the first time we have seen this certificate. The certificate has been folded and overall is in fine condioion. 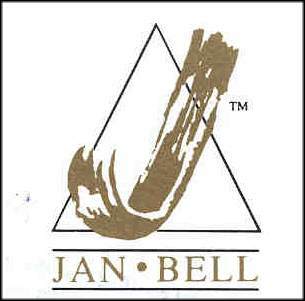 On July 5, 2000, Jan Bell Marketing announced at its annual shareholders meeting June 30 that its stockholders have approved the change of its corporate name to Mayor's Jewelers. The name change reflected the growth and expansion of its luxury jewelry operations with its commitment to its Mayor's retail platform, which was acquired in July 1998. Mayor's Jewelers Inc. is an upscale retailer of guild jewelry, watches and giftware. The Company operates 22 stores in Florida, two stores each in California and Texas, and one store each in Illinois, Michigan, Nevada and metropolitan Washington D.C., under the Mayor's name, and five stores in the Atlanta, Georgia, metropolitan area under the Mayor's and Maier & Berkele name (both referred to as Mayor's). Mayor's offers a large selection of merchandise at many different price points. This merchandise includes designer jewelry, diamond jewelry, rings, wedding bands, earrings, bracelets, necklaces, pearls, charms and high-fashion watches that are often not available from other jewelers in its markets.